Martial Arts, Self Defense and a Whole Lot More. 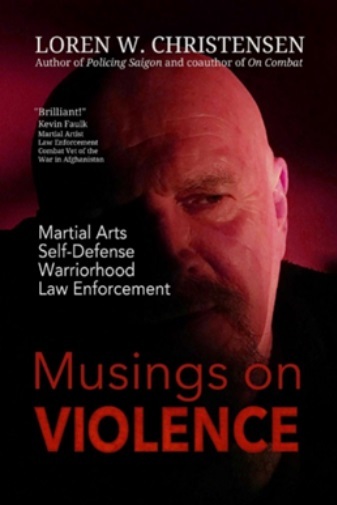 A few weeks ago, I finished reading Loren Christensen’s latest book: Musings on Violence : Martial Arts, Self-Defense, Law Enforcement, Warriorhood. In it, Loren looks back on the last 50 years of his life and he shares the lessons he learned. The best way to view this book is as a peek inside Loren life, memories and mind. He takes you on a wild ride of all the things he encountered when it comes to violence. Not just as a law enforcement officer but also as a martial artist. He shares numerous anecdotes and stories of the adventures he lived through. Some of them are hilarious, others are heartbreaking, with a lot of middle ground between these two extremes. Regardless, they all let you look at different aspects of violence, preparing for it and dealing with the aftermath. Loren also shares insights and tips on how you can train for handling the kinds of situations he describes. He offers a truckload of valuable and practical information, all of it hard-earned. It ranges from how to become faster and develop more flexibility to how you should hit the liver to get the best results. Or how you can control your fear when working as a police officer. These are just a handful of examples; the book is filled with so many more. There’s just so much of it that you’re bound to pick up a few new tricks and concepts. First, read all the way through. That’ll help you get an overall sense of the information in this book. You’ll probably latch onto one or two things during each reading session; apply these in your next training session. Then, pick it up on a regular basis and just page through it until you find something that inspires you to take a closer look. Read that part and apply in your training once again. In short, I highly recommend this book and you buy it right here. Note: This review was first published in my Patreon newsletter of June 2018. To receive the upcoming newsletters, sign up at Yellow Belt level or above right here. Sign up for updates on new books and videos from Wim! Get notified of new books and videos! Podcast episode 29: Which podcasts do I listen to? Boxing for self-defense, is it effective?